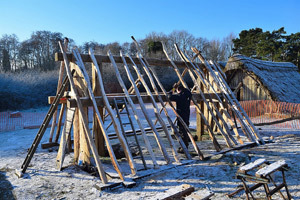 Historical Roofs, 2015 work at West Stow Anglo Saxon Village. 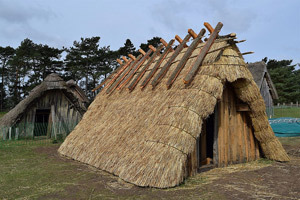 West Stow Anglo Saxon Village 2015. 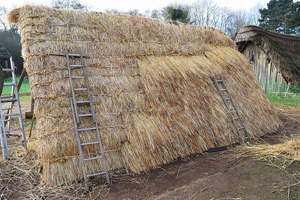 Over the last ten years I have been developing what's turning into a museum of early and experimental thatch along experimental archaeology principles and now West Stow as well as having many splendid hand made interpretations of Saxon buildings also has some unusual thatching - the latest structure has a basecoat of straw and gorse tied to the framework not with string as is so often the case on reconstructions but instead with handmade straw rope and some willow wands to hold the base layer which then has straw in little handfuls stuffed into it. 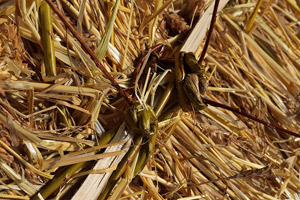 Working from the bottom up the roofs overlapping layers then form a waterproof covering. 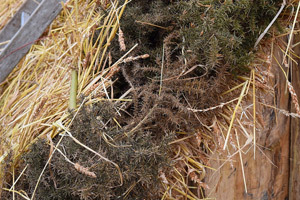 There was no string used (even in the building proces and later removed) as this was an experiment on early methods and I wanted to see if a roof could be made without modern fixings including string just as our ancestors did! 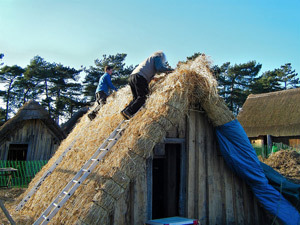 No twisted hazel spars where used either - the ridge is weighted down so again no spars - its good to have a functional finished roof... however for experimental purposes the methods used on the 'journey' to create a thatch are just as or even more important than the finished article as it teaches us the often intricate handmade old ways of construction of which today the processes are practically extinct in the UK. Further analysis of the build is forthcoming and will hopefully be written up soon by the archaeologist responsible for commissioning the work - Dr Jess Tipper.